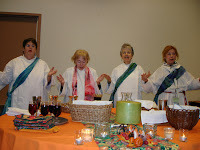 Victoria Rue, Ph.D. and Juanita Cordero M.A., ordained Roman Catholic women priests, have been dis-invited from celebrating Mass on April 26 at the regional conference of Call To Action-San Jose (CTA, a progressive Catholic organization: http://www.ctanorcal.org//). Members of CTA who work for the Diocese of San Jose communicated to the organizers of the conference that they would pull out of the conference program if Rue and Cordero celebrated Mass. Others who work for several of the local dioceses also said they would worry about losing their jobs if they attended the CTA conference in which a Mass by women priests would take place. Rue and Cordero, not wanting anyone to lose their jobs, offered instead to do a prayer service. The organizers agreed to this. However, these same people then made the further suggestion to the conference organizers that Rue and Cordero should not wear their stoles at the prayer service (stoles are symbols of ordination). Rue and Cordero said this was an impossible request and declined to do so. “This would be asking us to deny our ordination—and that we will never do” said Victoria Rue. The conference organizers have supported the women priests’ decision. The prayer service will take place Saturday, April 26 at 7:30a.m. The women priests will also offer two panels about their ministries Saturday at the Call to Action regional conference at 1:30p and 3:00p. Meanwhile, on Wednesday, April 16, Victoria Rue (who is also a professor of Comparative Religious Studies and Women’s Studies at SJSU) was dis-invited from a panel organized by the Muslim-Jewish-Christian Coalition (a student inter-faith campus organization) due to pressure from Fr. Jose Rubio of SJSU’s Catholic Campus Ministries. Rue had been invited by the students to participate in a panel to be held May 7 at 7:00pm. The relationship between these two dis-invitations suggests that there is a policy from the Diocese of San Jose to silence women priests, and all those who support them. We regret that the Diocese feels it is necessary to take these reported actions. To find,review, or purchase one of her books visit the website above or visit http://bridgetmarymeehan.com/books.html. You can find the list of books and contact her there. Both of these sites will have the contact information to Bridget Mary and how you can purchase the books. The visit of Pope Benedict XVI to the United States this week may have inspired renewed devotion in many Catholic faithful, but progressive church organisations here say that it's time for the Vatican to rethink its more rigid stances on issues like women priests, contraception and homosexuality.